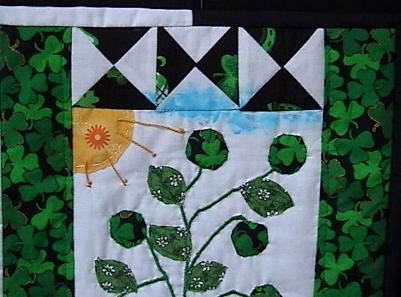 This is a beautiful new appliqued quilt that I made. I hand appliqued the berries using the olde fashioned needle-turn method. 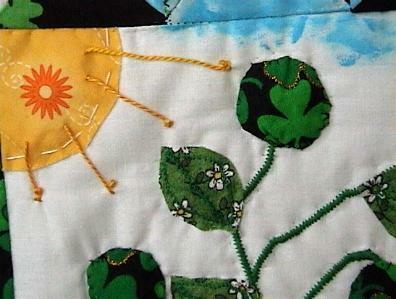 The sun was FUSSY CUT from a RETRO fabric and done by my hands with needle and thread and a running stitch. 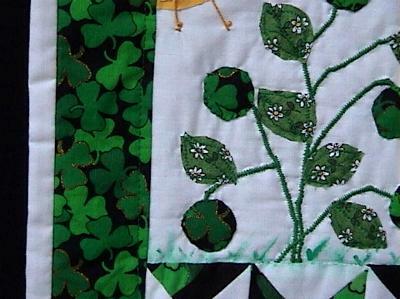 There is gold metallic surrounding some of the clovers. I made the quarter square triangle blocks to give the quilt a patchwork feel. 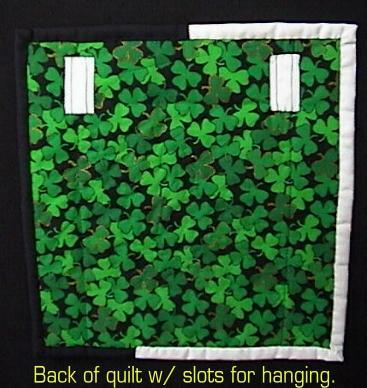 (for those who've just gotta have patchwork) LOL.The quilting was done BY HAND and with invisible thread except for two rows on both sides of the main section. The binding was finished by hand. Notice how I handpainted the blue sky. The leaves were done in the raw edge method with a fancy machine stitch. I added the sun rays with craft thread. I decided that a black and white border would go great for a cute and unique finish. Notice the cute little hand painted grass growing near the bottom. The stems are couched and machine embroidered. There are 2 slots on the back for hanging. Fabrics are good quality 100% cottons. The batting inside the quilt is polyester.